This is a repository for the Delphi LeakCheck library. LeakCheck is a memory manager extension that adds leak checking functionality. Main difference from the default memory manager is multi-platform implementation of leak checking with DUnit and DUnitX integration. Add LeakCheck.DUnit to your project (this is where the the memory manager plugs into DUnit) - there will be compile errors if you do the step above incorrectly. I recommend checking the latest DUnitX sources with extended reporting options (commit DUnitX/918608a) but other versions should be supported. Main goal of this library is providing pure pascal implementation of leak checking so it can be used across platforms, it also provides simple cross platform implementation of some basic functionality for synchronization and ansi char handling that is used internally. It can be used as a replacement of FastMM full debug mode but keep in mind that it is implemented to be safe and platform independent not as fast as possible so its use is recommended for testing only. So you can detect leaks between snapshot and last allocation. This is what DUnit integration does. In test results, you'll be able to see detailed leak information including class names, reference count, string and memory dumps. In addition to ignoring all classes, each class type can be inspected and ignored separately by assigning InstanceIgnoredProc (this can be useful to ignore globally allocated objects from RTL or other sources, like System.Rtti collections of objects and alike). This can also be used to ignore unreleased closures (anonymous method pointers). (See LeakCheck.Utils for more details). You can use ReportMemoryLeaksOnShutdown on any platforms. On Android the output is sent to logcat on WARN level using leak tag. You can use adb logcat -s leak:* to see it in console (adb can be found under platform-tools directory of your Android SDK installation). It is highly recommended to ignore tkUnknown leaks on Android (ARC) since the RTL will allocate data for weak references that are mistreated for leaks, System will release them during finalization. LeakCheck.DUnitCycle and DUnitX.MemoryLeakMonitor.LeakCheckCycle units implement cycle detection scanner that if given a reference will scan its reference graph to find any instances creating a reference cycle thus preventing the instance from freeing. This works only for managed fields ie. interfaces (and objects on NextGen) or if used together with UseExtendedRtti (enabled manually) any field with RTTI is supported. It can scan inside other objects, records, TValues, anonymous method closures, static and dynamic arrays (which mean it supports any of the System.Generics.Collections types). You need to manually register TLeakCheckCycleMonitor (or any descendants with more scanning options) as TestFramework.MemLeakMonitorClass to integrate it into your DUnit tests. You need to manually register TDUnitXLeakCheckCycleMemoryLeakMonitor (or any descendants with more scanning options) into the DUnitX's IoC container to integrate it into your DUnitX tests. Cycle detector scanner can optionaly use extended RTTI information (see TScanFlags), so scanning for object (not just using interfaces) cycles in non ARC environment is possible, but note that RTTI generation is required, for objects not supporting extended RTTI (ie. closures), there is a fallback mechanism to classic solution. 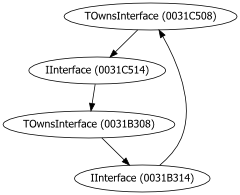 When using extended RTTI, the reference scanner may output field names holding the references as well (and add it as named edges for Graphviz, see bellow). This extension isn't tied to the memory manager itself and doesn't need it to run. So it can be used to generate object graphs in any application at any point of its execution, just give it appropriate entry point reference. LeakCheck.Cycle supports format flags in the TCycle.ToString method that can be set to generate Graphviz DOT format output. Combined with TLeakCheckCycleGraphMonitor that appends another needed information, test cycle output can be copied to a file (make sure to copy only the graph specification not the entire error message) and converted using Graphviz (dot -O -T png cycle.dot) to visual representation. You can also select different memory monitor TLeakCheckGraphMonitor which will generate full reference tree not just cycles. If registered, LeakCheck memory manager may acquire stack traces when some block is allocated which is then displayed in leak output either as pure addresses or formatted (if trace formatter is registered). Multiple stack tracers and formatters are available. Make sure to configure your compiler/linker properly. The safest solution is WinApi based stack tracer and MAP file based formatter (MAP file needs to be enabled in the linker settings and symbols generation must be enabled in the compiler to get line numbers etc.). JCL implementation offers better stack traces (RAW) on Win32 and offers more options while formatting the output (debug symbols, MAP file, etc.) but needs external caching. Android implementation cannot show symbols right away but the formatter allows you to feed the output directly to addr2line utility which will then output the symbols and line numbers. Fake VMT is assigned to an object (and if enabled to all interface entries as well) when it is freed. If virtual (or interface) call is made on a dangling pointer of such object, the call is reported and AV is raised. Ligthweight version may be used that will set fake VMT without reporting but will most likely raise an AV during the call. // report of all unreleased (and not ignored) pointers. // and report everything in between current allocation and given snapshot. // low-level functions so we need a helper. // (based on what formatter you want to use) then assign the formatter. Or just add any of the LeakCheck.Setup. * units to simplify this process. Sometimes it is useful to ignore public caches or other stuff when RegisterExpectedMemoryLeak is just not enough. // or any of the LeakCheck.Utils ignore functions. // function or use TIgnore<T>.AnyAndFields or TIgnore<T>.AnyAndAllFields. // functions but be careful when you do! Delphi between XE and XE6 should also work but was not tested. If you find any problems, please create an issue. Support for older version will not be added, some other versions may work but I will not test them nor will I add any patches that would add support to older versions. Although this library was tested on fairly large projects it comes with no guarantees, use at your own risk. This is a low level library at a very early stage of development so you may expect errors if you use it incorrectly or if you have memory issues in your application that the default memory manager survives somehow. But I'd like to get any input about issues you may run into, but please don't say it crashed my application, include stack traces or other technical information that may help me figure out the problem or better yet, submit patches. On Android (or actually any platform that needs libicu) the program may cause SEGFAULT during System unit finalization. This is caused by System allocating some memory before the memory manager is initialized and not freeing it properly (there are more comments in the LeakCheck source code). This should now be prevented in cases when the application doesn't leak any memory. Unless stated explicitly otherwise (in the code), the sources of this library is licensed under Apache License 2.0 (http://www.apache.org/licenses/LICENSE-2.0).